A few months ago I sat down and thought about what I REALLY wanted out of my beauty routine. What was my ultimate goal? I was surprised to discover that what I wanted was pretty simple: clear skin and long eyelashes. If I had those two things I would feel quite comfortable wearing little to no makeup most days. It also seemed like a totally unattainable goal. My skin has been a battlefield for 13 years. I've tried everything but Accutane and have had varying degrees of success. My skin has gotten much better as I've gotten older but lately (thanks to my thyroid and imbalanced hormones, I would imagine) it has been backsliding in a major way. I've read several blog posts lately about people using coconut oil to cleanse their skin and ACV to tone. 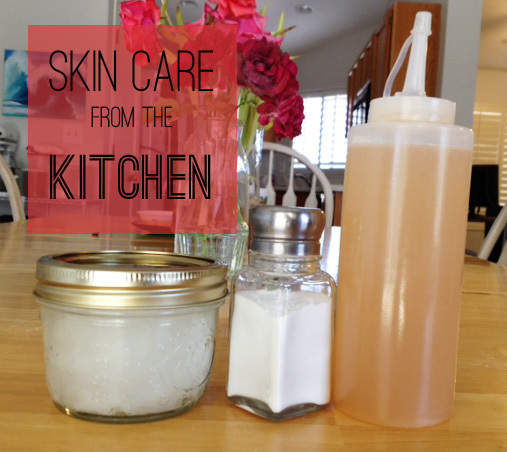 I gave it a try and, for two weeks, my skin was glowing and gorgeous. And then the breakouts began. Take a half teaspoon or so of coconut oil and rub all over my face and neck. Let sit for a minute. Use a washcloth and warm water to clean off the oil and baking soda. Here's where I get stuck. Coconut oil is fine for cleansing but leaving it on all day or night makes me break out. Which means I need another moisturizer option. Suggestions for clean moisturizers that don't make you break out?? In the morning I just use warm water and a washcloth to wake my face up. Also, I'd like to introduce you to my new favorite thing: bentonite clay. This container cost less than $7 at my local Sprouts and will probably last for months. Once or twice a week I make a mask with a heaping teaspoon of clay mixed with an equal amount of raw ACV. It makes a mousse-like concoction that feels wonderful going on (...and then it dries and you feel like your face is folding in on itself). As it dries it draws all the junk out of your pores. Last week I woke up with a bump on my jawline that I knew was destined to become one of those deep, awful, painful blemishes. I spot treated with a bit of clay and water for 15 minutes twice that day. Twenty-four hours later it was reduced to almost nothing. It's not always quite that miraculous but it has helped a LOT with keeping breakouts shorter and more rare. Anyone else have good chemical-free skin care tips/products/etc.? *Use raw ACV and make sure the bottle says "with the mother" on it. That's the good stuff right there! I found it at my regular grocery store in the health food section. Also, unless you love fruit flies buzzing around your bathroom, make sure you keep this in a CLOSED container (I love my condiment bottle). Rinse your cotton ball before tossing. Cool! I started no-pooing a few months ago and so I am interested in trying this! Thanks! I'm looking into natural moisturizer as well, or at least something that's "clean" and paraben-free. My skin is just so darn sensitive. Also, I think it's time that I bought that clay. The past couple of weeks have been breakout central (have no idea why) and i'm sick of this! Oh my gosh! My mom and all my sisters and I have been using that Aztec healing clay for as long as I can remember! I can't believe I forgot to mention that one to you! So glad you found it. Isn't it incredible how you can literally feel it sucking junk out of your face? Hah. And it does go such a long way.. Just a couple drops of water to a pinch of clay and you've got an entire face worth of mask! I love bentonite clay!! I use it every week. And I am going to have to try baking soda and coconut oil, your skin sounds a lot like mine and plain oil did not work for me either. Thanks for all the reviews! I have so been looking forward to this post! I feel like I've had some of the same struggles as you with coconut oil....like, I want it to moisturize but I feel greasy if I leave it on all the time. First, the baking soda you suggested as an exfoliant has been such a great choice for me. I feel like it really gets the GRIME off my face. As for moisturizing, I've gone with the method of using verrrry little coconut oil and putting it ONLY on my dryest areas...then I dab it off with a towel a little bit so I'm not all shiny. It has seemed to work OK! Now I just need to get more ACV (because I ran out) so I can try this toner business. And....bentonite clay. You've inspired me! Jojoba oil is amazing as a moisturizer! A little goes a long way so a $7 bottle from Trader Joe's will last forever. I use in at night and in the morning under makeup. Perfection. I second jojoba oil!! I use it as both cleanser and moisturizer and I've had maybe three pimples in the last six months. My phone freaked out and I couldn't finish my comment! I also find that on the days that I'm too lazy/rushed to put in make up, I really don't mind. My skin looks good, so who needs it?!? I love using coconut oil/etc... for my body, but am unsure what to do now that warm weather is here and I'm outside all day. What do you do for sunscreen? I'm happy to use a hat, but am super fair and have skin cancer concerns. I am so trying this! I have all the ingredients in my cupboard as we speak... how long until you saw results? I also live in Arizona, any thoughts on sunscreen? I LOVE this post! My skin broke up with chemicals last year and I am so glad. It hasn't always been a perfect transition (I have very sensitive, dry skin) but I feel much better about not putting so much garbage on my skin and into my body. By the way, a great resource for chemical-free beauty is Crunchy Betty.